The latest installment of our Short Film Contest brought such excellent submissions and such fierce competition that we had eight instead of the usual six finalists this time around. Yikes! To those of you who submitted, we’ve told you this before but we’re gonna say it again: please keep making such strong work, and please keep submitting that work to our contest! Per usual, we’d like to give big, cozy thank you hugs to our judges: David and Nathan Zellner (do not miss their new feature Kumiko, The Treasure Hunter if you’re attending this year’s Sundance! ), IFP‘s Amy Dotson, and previous contest winner Lauren Wolkstein (for Social Butterfly). Also, a big thankssss guyssssss to our participating fests: Los Angeles Film Festival, Sarasota Film Festival, Maryland Film Festival, IFFBoston, Nashville Film Festival, RiverRun International Film Festival, Sidewalk Film Festival, Northside Festival, and New Media Film Festival. That’s a hearty chunk of festival waivers! We’re finalizing the details—judges, participating fests, etc.—for our Spring ’14 contest, so get your latest-and-greatest shorts ready to submit to the next edition, but for now, let’s congratulate the two lucky ducks who made it to the tippy-top of this contest’s list. Amy Dotson had this to say about Christoph Rainer’s stunning film (which understandably won the RBC Emerging Filmmakers Competition at the 2013 Toronto International Film Festival): “A total discovery. Visionary, weird and yet simplistic like a good fable. Both timeless and timely, I loved it.” Amy is right! I’d actually go so far as to say that the world has never seen a more unexpectedly poignant film about moving to New York City and drinking oneself into a depressed stupor before hitting rock bottom and returning home defeated once again. A less creative type would make a self-confessional drama about this subject, cast someone who kinda/sorta looks like them and embarrassingly romanticize this situation. 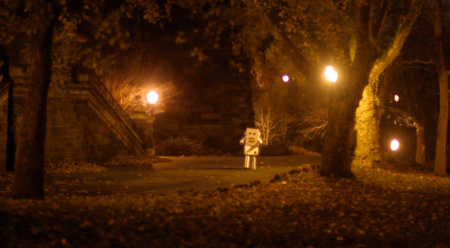 But here, Rainer makes his depressed alcoholic person be a robot, while still delivering a truly emotional experience. Based on this short alone—and very unlike the lead character in his film—the future looks incredibly bright for Christoph Rainer. Lauren Wolkstein had this to say about Reinaldo Marcus Green’s stellar drama: “Green does a beautiful job of capturing adolescent insecurity and the cautions of first love through the eyes of a girl who feels completely lost in her own environment. Stone Cars has a very specific sense of place, teeming with authenticity through Green’s use of narrative and doc hybrid shooting styles, capturing the real horror of being a teenage girl trapped in a dangerous location.” Lauren’s right too! Read my full HTN review of the film, but not before you hurry up and watch it for yourself while you still have the chance!